DynaPack® combines touristic services of different suppliers. The offer will then be booked online as a complete travel package. This process is called Dynamic Packaging® and has been developed by znt Travel. Using this technical innovation the graphical presentation of bookings - both in the Internet and in the CRS system – is very user friendly and on the other hand it is combined more complex than before. A further advantage is the real time process. 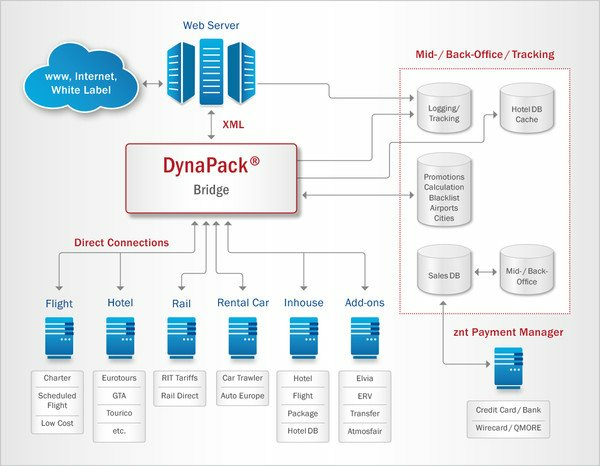 In order to achieve this, DynaPack® operates as a bridge with its own logic between the Frontend and the touristic provider systems. Therefore different systems with different interface definitions can communicate via DynaPack®. DynaPack® enables the combination of several different and/or equal services online in one booking step. The service information will be collected and evaluated in the session memory during the booking process. The data traffic is processed via DynaPack® in real time instead of communication with the Frontend. DynaPack® can communicate with all established systems. Numerous direct connections to well-known providers are already set up. The users of DynaPack® are independent of CRS providers, flight-, hotel-, rental car- and other touristic systems. Work level for the user is an Internet Frontend or a CRS application for all services. 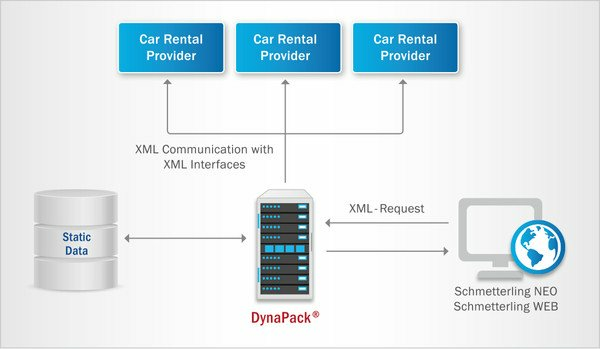 The services will be requested directly from DynaPack® via a configurable interface to the system of the service providers and can then be combined and booked. DynaPack® evaluates the offers from systems such as CRS, IBE, organiser systems, Mid- and Back-Office, payment systems or account departments and presents them to the user as a complete quote and/or as a single service using the calculation tables stored in the database. The session memory buffers information which is necessary during the complete booking procedure. For tnvoicing the summarised services will be transmitted to a Mid- or Back-Office System. For the operation of DynaPack® no special hard- and software platforms are necessary. Successful Dynamic Packaging® has to meet some criteria: The access to a big number of comparable offers, for example in the field flight, hotel and rental cars. A search function by personal selection criteria with price comparison. And a booking tool offering an online access to all service provider data and bundling all selected services as a package. The product solution for this is called DynaPack®. Single services, such as flight, hotel and rental cars are combined in real time in one booking step and stored online in the shopping basket. The necessary information of the service providers will be picked up from the respective reservation systems and are presented to the user as a complete package at one price and / or as single services on the basis of the stored online calculation rules in DynaPack®. All rules and conditions of the service providers are already considered during the booking process. So the big advantage is that the provider does not have to enter any external data and can always access actual prices and availabilities. The product range can be completed by further modules at any time. A2B Transfers, AutoEurope, CarTrawler, Condor, Deutsche Bahn, Elvia (Global Allianz Assistance), Europäische Reiseversicherung, Eurotours, GTA, HitchHiker, Tourico Holidays, TravelTainment, TUIFly, etc. Individual direct connections can be realised any time without delay.